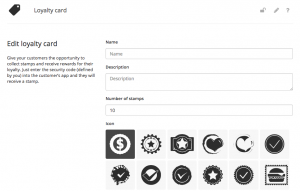 Integrate the stamp card by selecting a name, a suitable icon and the number of stamps to be collected. Returning customers can be rewarded for their loyalty. To assign the stamps, simply enter the security code (which you have previously defined) into your user’s pwa. Under user status you can see how many stamps your users have already collected and how many prices they have redeemed. The stamp card module can be added to your dashboard under modules -> Insert +Module. After selecting a suitable icon for the stamp, a security code must be entered. This allows you to give your customers another stamp for your loyalty. The module is ideal as a tool for customer loyalty. Further advantages of the stamp card can be found in our blog. Alternatively, the TAN procedure can also be used. You can generate up to 100 TANs per CSV file. You can transmit these to your customers directly on site, via push message or chat function. The special thing about it: Your customers no longer have to hand over their smartphone and can collect their stamps by entering the TANs into the progressive web app themselves. 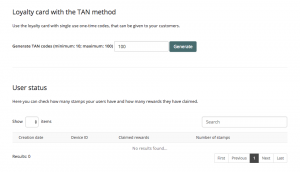 Find out more in our blog post about the TAN procedure for the stamp card.